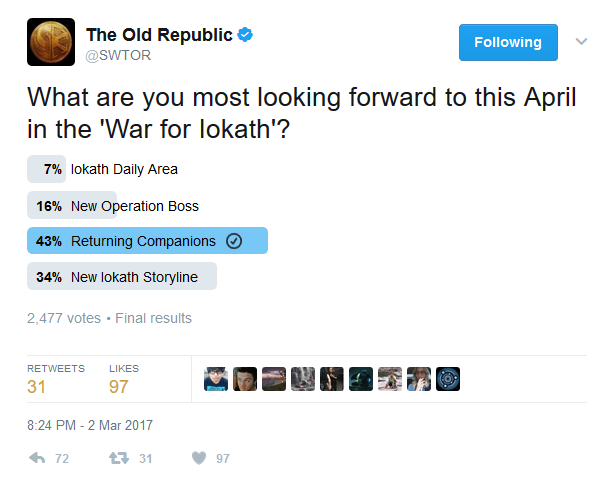 The other day the official SWTOR Twitter account asked: "What are you most looking forward to this April in the 'War for Iokath'?" Somewhat to my own surprise, I found myself wishing that the poll had an "all of the above" option. I'm actually more excited for 5.2 than I've been for a patch in a long while. Let me explain why by going through the four things listed in the poll that Bioware figured we would get excited about. I've liked KotFE and KotET well enough (and have spent a lot time writing about them on this blog) but... they weren't really the stories I would have chosen for my characters if it had been up to me. I can live with the class stories not getting continued, but the Republic-Empire conflict, for me, is too much of a core tenet of Star Wars to be able to let go of it. On my trooper main at least (less so on some alts), I basically played through KotFE and KotET with an attitude of: "Well, this is bad; guess I gotta sort this out before I can get back to saving the Republic." But I never let go of my roots and the wish to eventually get back to them. It took them two years, but it looks like I'm finally getting what I wanted, a chance to reconnect with my origin faction! The option to ally with your former enemies instead is a nice bonus from a roleplaying perspective, though I'm not sure I could see any of my own characters going for it. I'm also genuinely curious to see how the story continues from here, as KotET's ending left things in a kind of awkward place from a storytelling perspective. I'm looking forward to seeing what Bioware's writers can come up with though. I'm trying not to get too hyped because I don't expect the actual story part of 5.2 to be all that meaty, but just seeing things go in the right direction again (for me) makes me want to squee. OK, this one doesn't have me that excited because I don't really like dailies (it also got the least amount of votes in the poll). But it has been two years since we last got a new daily area in the form of Ziost, so why not? I'm looking forward to getting another zone to play in and to actually have a reason to go there more than once for a story quest (unlike Darvannis for example). Also, I expect this to mark the first time since Ziost that my pet tank and I will be able to play story-related content from a new update as a duo (since 4.0 and onwards was all solo phases, and I'm not counting uprisings as they are meant for a full group). If that's not exciting, I don't know what is! Companions have gone into a slightly odd direction since 4.0, with somewhat contradicting design decisions being made. Specifically in this case, we have a lot of them but probably only care for very few because we don't have much of a story connection to most of them! Our original class companions are still different though. They all had their own story arcs, and especially the early ones really built relationships with you. I mentioned before how I didn't think I was too attached to my companions, but actually losing them made me realise that I missed them quite a bit after all. So getting Elara Dorne back, the last trooper companion whose fate had been unknown until now, has me excited. Conveniently my main alt for story purposes is currently a warrior, so she has reason to be excited about Quinn's return as well! Since she romanced him, that one's going to be somewhat emotionally charged, and I genuinely don't know how it will go. It will depend a lot on how Quinn acts after all this time apart I suppose. Either way, I'm very much looking forward to finding out! I'm not at all surprised that this option won the Twitter poll by quite a margin. OK, so a single new boss instead of a full operation isn't exactly what I wanted, but I'll take it. I've probably weathered the drought of new operations better than many raiders since I seem to be able to rerun old group content for longer than the average player without getting bored, but I'm still excited to finally go up against a new enemy with my guildies again. And as Rav has laid out in an excellent speculative blog post, what little we know about the new operation seems to indicate that it will have interesting lore as well. Gimme! 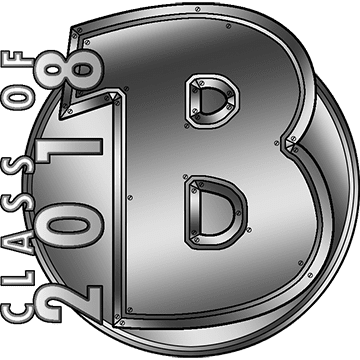 Basically, all signs seem to point at this "Oricon-like" patch being a return to more traditional content updates instead of all story chapters, all the time, with more open world environments, new group content, story progression outside of dedicated chapters and a return to the themes and characters we love. I can't wait! I suffer somewhat from CXP PTSD, so I'm not excited as you are, unfortunately. But these 4 things I do look forward to,and yes, that includes the daily area. It's not so much that I love dailies (although they can have a relaxing effect), but I did like Iokath (especially the overgrown parts) and when you only visit it instanced as part of a story, it doesn't feel like you've actually 'been' there. I love to explore places. Not sure if I'm making much sense, but at well, I'm looking forward to that at least. Aww, this whole CXP thing has really traumatised you, hasn't it? Maybe we need to form a support group. I totally get wanting to explore more of Iokath! I hope the new zone is more like the overgrown areas from chapter 4 and less like the later stuff. I didn't find that as appealing. I just recently broke level 70 on CXP and Finally got my full set with bonuses, course last two pieces I got from the fleet. I've been doing PVP with my Merc Bodyguard, and having fun with it. All 230 though, but eh, it's a start right? Course it also helps that I'm in a new guild, and we like to q up for PVP/Starfighter on the bonus days. I cant wait for 5.2 to drop. 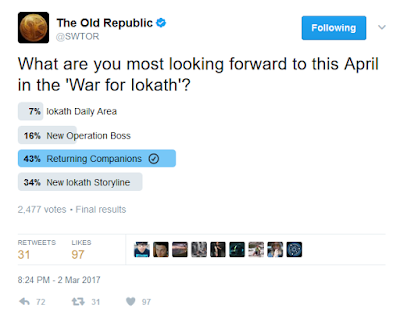 Not for the increases(Supposedly, we know how BW likes to break things) but more importantly for the companions coming back. Course I have a DS V Mer, with Arcann as a companion, Now figure that one out! !..But yeah I'm having fun playing regardless now. Glad to hear you're having fun with the game again! (Last I checked, you didn't seem too happy with your current state of affairs.) Mixing it up and trying something new or different can certainly help a lot. Eight hours of PvP in a single day sounds bad for anyone's sanity in my opinion!